Trianna recently posted..Go Girl! It’s your SITS Day! Jamie recently posted..Stress and Heart Disease! In theory, anytime you influence someone, whether they are a social media powerhouse or a casual user who doesn’t even know what Klout is, your score should be positivity affected. But I agree, “it is what it is” and nothing to stress over. That is really interesting. I would love to see what will happen. 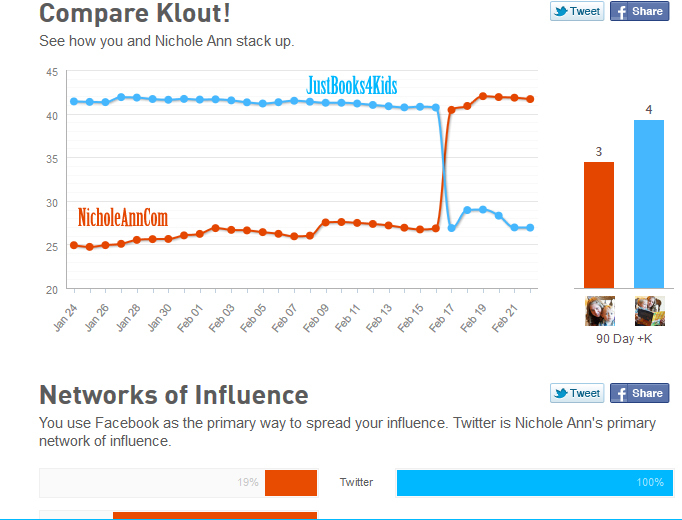 I was trying to understand the Klout and I was working on bringing the score up, but eventually I gave up. Of course, I admit to slacking big time when it comes to my book site. I don’t work to bring my scores up, it’s too much of a stress and I’d rather focus my energy elsewhere. Still find it interesting though like you said. I deleted my Klout account completely. There are a lot of issues with Klout’s methodology, particularly that they create accounts for users without their consent. I received some ‘perks’ but not a single one was related to my blog! I think this is super interesting! I have had love (great fashion perks!) and hate (weird score shifts) with my Klout score, but I do still recognize its significance. I was doing well with Klout before the changed how they calculated the scores and after I completely plummeted I deleted my account. It felt so good because in blogging of course there are so many different ways to measure how “cool” you are that it can make you feel down sometimes. Now it’s just one less thing to worry about…I did however hear there is a Pinterest type Klout thing now. I won’t be joining that either. I was a huge fan of Klout, when if first came out. Now, I’m pretty sure it’s just a crock of poo. I just want to know what kind of algorithm they use, to get their scores. the methodology is so obscure…. I am back to peer index – do you use that? Rachel recently posted..Kids Off School & I Am Happy!